After the August 21, 2013 sarin gas attack near Damascus in Syria, the Zetas predicted the outcome. It would be announced that the rebels did it, and no attack on Syria would occur. ZetaTalk Prediction 8/31/2013: The use of poison gas in Syria was arranged by Israel. Of course it wasn’t Israeli soldiers. Of course they were very much behind the scenes in supplying the rebels. Not just a hand away, but many hands away, so that it would be impossible, literally, to trace where the gas came from. This is arranged by killing those intermediaries. And why did they do this? If the US gets involved in Syria, it will bleed over, they hope, into Iran. Iran has been backing Assad. The US will fight their war and they can go on taking land from the Palestinians. Everybody will look away and they will have the US as their own private army. Will this ever be proven? No. Will this be suspected? Yes. So therefore, a war will not be started here. Assad it not going to be pummeled by the US. It will be announced that it was a false flag, the rebels did it. This is nothing different than has already been announced in previous times. This had certainly been the case in prior incidents. The March 19, 2013 incident near Aleppo was demonstrably the doing of the rebels. The results of the analysis indicate the Bashar 3 rocket was not industrially manufactured and was filled with sarin. The samples indicated the sarin and the projectile were produced in cottage industry conditions. The absence of chemical stabilizers, which are needed for long-term storage and later use, indicated its possibly recent production. Therefore, there is every reason to believe that it was the armed opposition fighters who used the chemical weapons in Khan al-Assal. Chemicals used in the March 19 attack did not belong to standard Syrian army ammunition, and the shell carrying the substance was similar to those made by a rebel fighter group. Where the US media, in support of Obama, reiterated the conclusion that it was Syria under Assad that was responsible in Damascus, the US intelligence community was hardly of that opinion. And all the compelling evidence that the rebels had yet again done the deed was being ignored. The chemical weapons were allegedly produced by an individual person in the ranks of the Syrian Al-Qaeda offshoot – Hani Nour Eldin Aqeel. The poison gas / chemical weapons was produced in a workshop of the al-Nusra Front in the Syrian city of Yabroud. Afterwards, the poison gas (e.g. Sarin nerve gas) was transported to the city of Douma in domestic gas capsules, which are not uncommon in Syria. The report itself was published by the Arab news website Asianews. The former hostages - Belgian teacher Pierre Piccinin and Italian journalist Domenico Quiric - said they overheard an English-language Skype conversation between their captors and other men which suggested it was rebel forces, not the government, that used chemical weapons on Syria’s civilian population in an August 21 attack near Damascus. Then why did Obama take this stance, insisting the Assad government did the deed? This was false posturing, per the Zetas, to offset an anticipated attack by Israel and the banking industry, in conjunction with the cover-up crowd, to claim Obama is so weak that he invented Nibiru as a claim to distract the public. This was to gut the announcement, and in essence continue the cover-up. Will this work? Per the Zetas, they lost the game almost immediately, as Obama did a complete about face and became a hawk, knowing that Congress and the American people and the UN would not allow him to attack Syria. ZetaTalk Insight 9/7/2013: Are Obama and Biden and Kerry playing a game, appearing to be as dumb as an ox about the “evidence” they have that Assad did it? Why is Obama stopping just short of rushing into another Middle East war when he has always been cautious about this and trying to extract the US from these conflicts? This seeming personality change on the part of Obama, a complete about face on keeping the US out of Middle East conflicts, and complete loss of insight and balance on who might be responsible and what steps to take (such as waiting for the UN inspection results) is puzzling. But it is an act, a chess game of the highest order. By becoming a hawk, in a very safe environment, Obama has stymied their argument that he is a weak president trying to create a distraction with the announcement. Any argument that Obama has invented Nibiru to get a weak President off the hotseat will have been countered, as Obama appears the strong one. We have described bait and switch techniques being used to catch the cover-up crowd in the US. This is an example of a feign and switch, a maneuver opposite of what is intended or expected while the real maneuver is taking place, unnoticed. Seismologists clueless about the Antarctic Plate roll are puzzling over a phenomenal increase in earthquakes in Gippsland, Australia. This region, above Tasmania, is where exceptionally high waves were recorded recently, puzzling meteorologists. This was outlined in Issue 362 of this newsletter on September 8, 2013 where the Zetas explained that the Antarctic Plate was rolling in a clockwise manner, hooking the Australian Plate. Now yet more evidence is in hand that the bulge on the Antarctic Plate is indeed pushing against the Tasmania region. Gippsland is just above Tasmania, the same region that experienced high waves last August. Scientists in Victoria are attempting to learn more about the increase in the number of earthquakes in the Gippsland region. There were only 50 earthquakes recorded up until 2009, but since then there have been 700. The activity has been particularly high in the Strzelecki Ranges which lie between the Latrobe Valley and the Gippsland coastline. ZetaTalk Explanation 8/24/2013: Due to the S American roll, which is caused by the spreading Atlantic, there is a natural tendency of the Antarctic Plate to roll clockwise, pushing the tip of S America toward Africa. We have mentioned that the compression in the Pacific Plates tips the Antarctic Plate also, which ultimately results in new land emerging between the tips of S America and Africa. As this roll of the Antarctic Plate begins, it will also tend to push under the Indo-Australian Plate, which is in any case lifting on its eastern edge and thus providing an opening for the Antarctic roll. 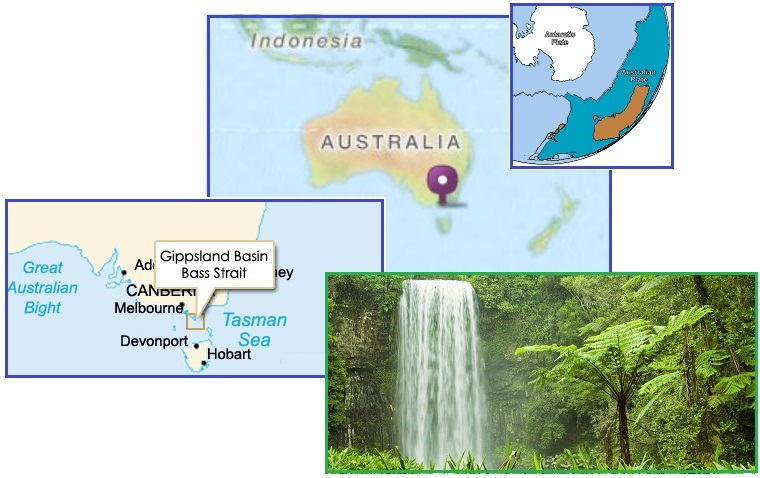 If such a nudge up occurs, the water atop the Indo-Australian Plate will slosh, and this is what occurred on August 19 near Tasmania. 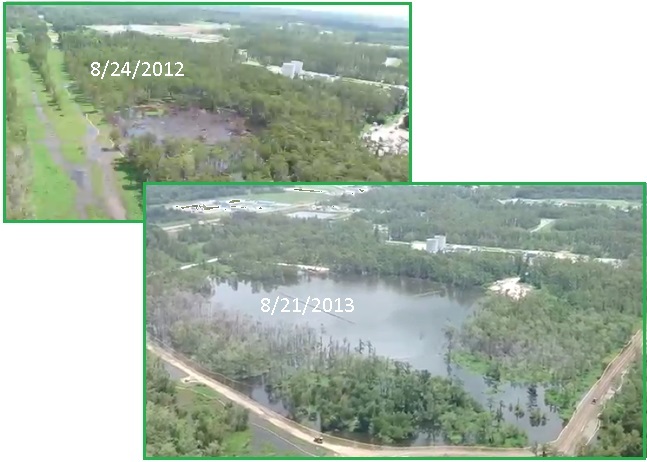 The Bayou Corne sinkhole has been growing steadily over this past year, no end in sight! This was first covered in this newsletter in Issue 309 on September 2, 2012 and again in Issue 347 on May 26, 2013. 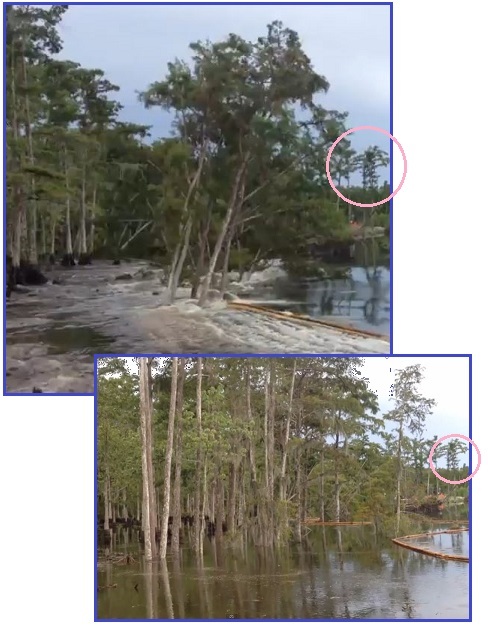 On August 21, 2013 the sinkhole ate several large trees in dramatic fashion, all caught on video. A year after the largest sinkhole ever documented appeared, the cavity is almost 30 times larger, and containment does not appear to be any closer. The Bayou Corne Sinkhole is currently at least 28 acres in size, and still growing. As the Zetas warn, given the bowing of the N American continent and the pending New Madrid adjustment, the Salt Dome caverns used to store petroleum are going to continue to rupture. And it is not just Bayou Corne that will be affected. ZetaTalk Warning 12/15/2012: It is more than just that sinkhole, as numerous salt dome caverns used to store petrol products are in use in the region. In times gone by, garments were made by hand, from natural materials. Now they are as likely to be made from synthetic material, poured into molds, and those who purchase modern clothing and bedding from stores are clueless on how to make replacements. After the Pole Shift, survivors in industrialized countries will be thrown back to a lifestyle prevalent centuries ago. What will you do when your shoes are in pieces and your clothing is in shreds? It’s really not that complicated! Start your education by learning about natural fibers and materials. Familiar and easily obtained materials are wool from sheep or shaggy animals, cotton, and flax fibers for weaving into linen. All are amenable to being combed into long fibers, in preparation for being spun into yarn or thread. 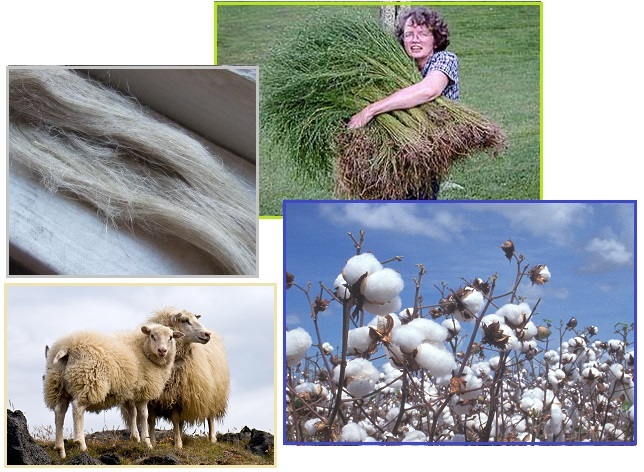 Wool is washed to remove dirt and oils, linen soaked to rot away plant material from the fibers, and cotton simply cleaned of husks and seeds. Since wool tightens and shrinks when heated, a type of cloth called felt can be made from small scraps. The felting process is to lay wool fibers in different directions, then pour boiling water over the lot. Felt is durable and wet felt can be formed into slippers. After being spun into yarn, fibers such as wool can be knitted into garments using a pair of knitting needles or crocheted via a crochet hook. Transforming natural materials into clothing in this way has been done by idle hands in the evenings around the fire for centuries. Felting is boiling wool so that it shrinks and tightens the fibers. 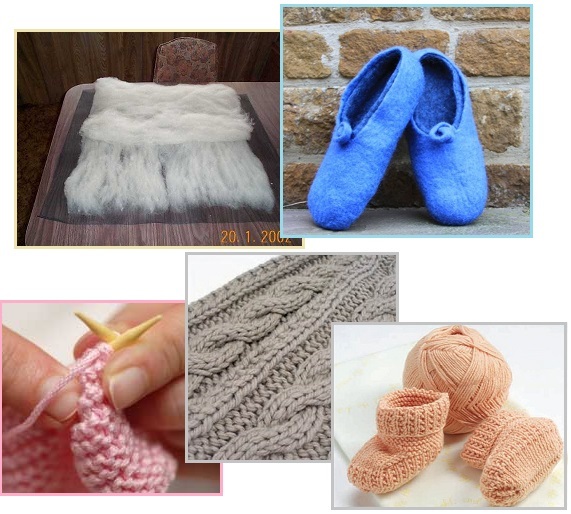 The boiled wool must be spread out to dry, into sheets or formed into slippers or other objects. Then dried. Curing leather to be used in coats or shoes or chaps is messy at first, because the leather must be scraped clean. There are many chemicals used for curing leather, but one survivors are almost certain to be able to obtain is the time honored tannin from the bark of many different trees. Some rivers even owe their dark brown color not to mud but tannin from trees upstream. That’s the case for the Baraboo River that flows past my house here in Wisconsin, for instance. Soaking the leather in a mash from the brains of the animal is another tanning technique. Most cloth is woven on looms from threads and wool spun into a fine twist. But leather is just cut into the appropriate sized pieces. Regardless of whether knitted, woven, or from pieces of leather, cloth requires needle and thread at some point. This is for stitching by hand, or by machine. 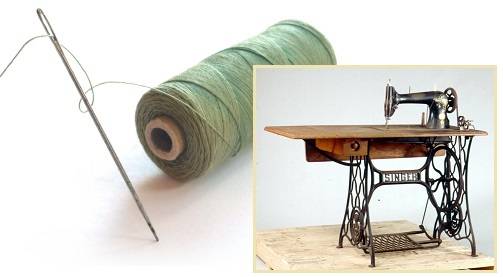 In the future, when electricity might not be available, a treadle sewing machine is just the thing. They can be found at yard sales, in barns or antique stores, for sale on eBay, and even manufactured new these days. One can create string and yarn with just a twirling distaff, or one can go into rapid production by using a spinning wheel. Making 3-ply yarn is something that a spinning wheel can accomplish, as noted below. These drawing were done by Nancy, and are found on the Troubled Times site. I, Nancy, inherited my great grandmother Frederika’s spinning wheel, and learned how to use it. It had a little bit of thread from her spun flax still on the spindle. This is not a mystery item, and can easily be constructed by a carpenter using hand tools! Spinning a thread, a rope, or a strand of yarn involves three steps - straightening the material to be spun, putting a twist in a thin strand of the material, and winding the twisted strand onto a bobbin. Material to be spun can be any fibrous material such as wool from animals, flax or cotton from plants, or silk from silk worms. 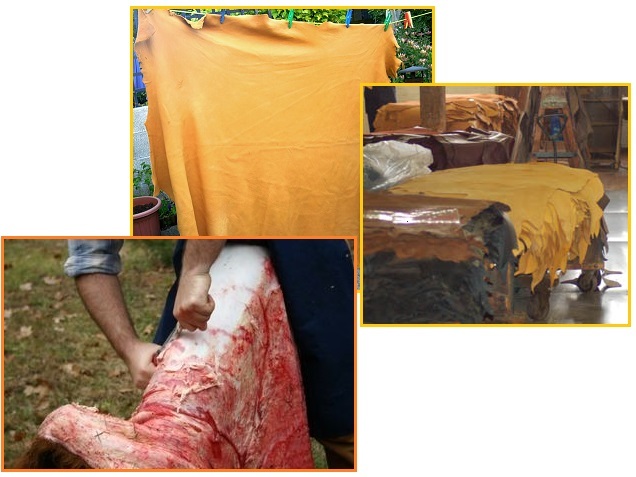 Preparing the material involves washing it, and in the case of flax, soaking and working it in water to remove rotting soft matter from the fibers. The clean fibers are then combed straight or carded, an action where the fibers are caught between two flat wire brushes, called cards, and pulled in opposite directions. In the most primitive form spinning is done with a distaff and spindle, where the hand-held spindle is moved in a circle by wrist movements and after a twist is put into the thread, is wound by hand onto the spindle. This process is used in one form or another in primitive cultures around the world. The spinning wheel improves this process, allowing a foot pedal to create the spin while the hands are free to work with the material. The foot pedal is attached by a strap to a special spoke sticking out from the center and to the side of the wheel. When this special spoke is on the downward side of the circle, the foot gives a gentle nudge to the foot pedal, encouraging the motion. When on the upward side of the circle, the foot releases, allowing the pedal to raise up so as not to slow the motion of the wheel. There is a groove in the wheel that holds a cord, and a similar groove in a tiny wheel on the other end of the Spinning Wheel. The relatively slow motion of the large wheel thus makes for many turns of the tiny wheel, which is attached to the bobbin. This bobbin replaces the more primitive spindle. 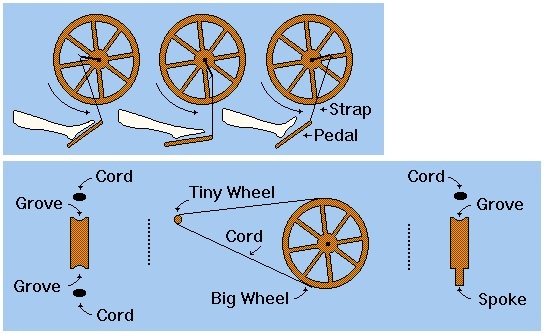 Enough tension is placed on the cord wrapped around the wheel and thence to the bobbin so that the cord does not readily slip on either the wheel or the bobbin. The knot in the cord should be as smooth as possible. A portion of the clean and straightened fibers are hooked onto the pointed end of the bobbin, and the turning motion begun. The material is first drawn out gradually to a thin thread while attached to the end of the bobbin. The spinning wheel now is giving a twist to the thread. The drawing out of the material should occur simultaneously to the twisting, so that the twist climbs back toward the receding hand. When the material is twisted to an arm's length, the thread is allows to wind up along the length of the bobbin, coming back to the tip for the next thinning and twisting action. During twisting, a slight tension holds the thread back from winding on the bobbin. To prevent unraveling and give added strength, the single ply thread is spun in the opposite direction, into a three ply strand. This is done by running single threads between different fingers of the hand, skipping the twisting step and just winding onto a large bobbin while turning the wheel in the opposite direction from the direction used to create the single ply strands. Unraveling is prevented now because all twists are blocked by an opposing twist. Once you have thread and yarn, you can weave cloth on a loom. Looms can be large or small, producing heavy cloth or something lightweight like linen. The details and drawings below are again taken from the Troubled Times site, with the drawings once again done by Nancy. Yes, I had a loom as well as a spinning wheel, and am familiar with the workings. Once again, this is an item a carpenter could construct with hand tools. Weaving requires two different threads - the warp and the weft. The warp is long and strung from the front to the back of the loom; the weft is laid from side to side during the weaving process. Looms can be large, several feet wide, or small enough to be placed on a table. Cloth woven on a small loom can be sewn together to make a larger piece. The warp is long, runs from the front of the loom to the back, and is wound around horizontal wooden bars at the front and back. These bars turn, to wind the warp at the front end or unwind the warp at the back, by using a simple notched grip attached to the ends of the bars. 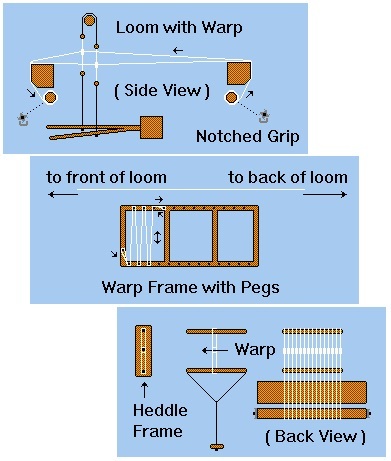 The warp is strung by winding a continuous thread around pegs on a warp frame. Wind the thread back and forth several times, creating several warp threads at one time, and then grip the bunch on both ends and transfer the warp lengths to the loom frame. This is done repeatedly until the warp is as wide as the loom or as wide as desired. Make the warp as long as possible, as the very front and back of the warp can never be woven and become waste or fringe. The warp threads on the loom are threaded through heddles, which are also made of string or thread. A heddle is in essence a small string loop inside a larger string loop, with the small loop in the middle to hold a warp thread so it can be raised or lowered during the weaving process. The heddles are made on a heddle frame composed of three nails on a board, the top loop tied above the middle nail, then below the middle nail, then below the bottom nail. The warp threads are strung through the heddles in the two heddle racks so that the odd warp threads go through the heddles on one rack, and the even warp threads go through the heddles on the second rack. Then, by pressing one tread or the other, the warp threads are raised and lowered by a pulley action, creating a criss-cross that secures the weft threads passed back and forth across the warp. 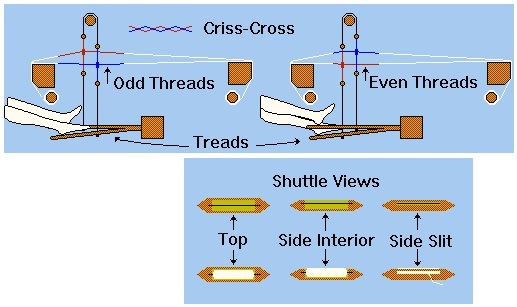 The weft threads are wound onto a bobbin, a metal rod, that is passed back and forth across the warp threads inside a shuttle, as though they were sailing across the warp threads inside a tiny boat. The shuttle is a size that can be held in the hand, longer than wide, and the wood is smoothed to avoid snagging during the weaving process. The shuttle has a rectangle cut from the center where the filled bobbin is placed. The metal rod of the bobbin is held in place by notches at the ends of this hole. A slit is cut at the side where the weft threads unwind. 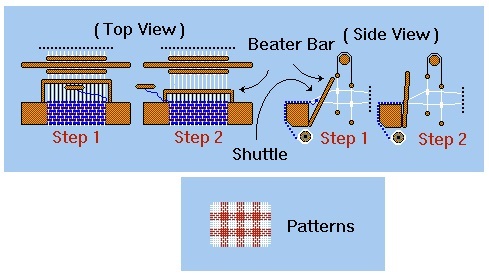 After the shuttle is passed and the weft thread pulled so there is no slack, the beater bar is pulled forward to tap the weft snug against the criss-cross of the warp threads. Then the beater bar is dropped back, away from the weaver, and the warp threads reversed by the heddle pulley action controlled by the foot treads. The beater bar has a thin wire or reed to go between each warp thread, and is not used with force but a gentle tapping action. Different patterns can be woven into the material by alternating colors in the warp thread and using a number of shuttles - a checkerboard by alternating groups of red and white warp threads and also alternating groups red and white weft threads. The edge of the material should be kept trim, so the material won't unravel, and when the material is removed from the loom the warp threads are tied on both ends and can be left as a fringe or woven back into the material with a needle to secure them.